By the mid eighteenth century, a number of parish or township poorhouses had been established in the Richmond/Teesdale area (Hastings, 1996). Arkengarthdale had one by 1751, Grinton by 1752, Reeth by 1753, Feethams by 1764, Melbecks and Bowes by 1768, and Richmond by 1780. In most cases, the poor were "farmed" by a contractor employed by the parish to manage the care of its local poor. In about 1794, Richmond erected a new workhouse on Long Hill (now incorpotaed into Victoria Road) at the north-west of the town. Designed by local architect John Foss, the building also incorporated a "House of Correction" or local gaol. The site and the gaol were owned by Richmond Corporation, while the Richmond parish vestry financed the workhouse. North Riding of Yorkshire: Aldbrough, Appleton, Arkengarthdale, Aske, Bolton-upon-Swale, Brompton-upon-Swale, Brough, Calbourn, Caldwell, Catterick, North Cowton, Downholme, Easby, Ellerton Abbey, Ellerton-upon-Swale, Eppleby, Forcett with Carkin, Gayles, Gilling, Grinton, Hipswell, Hudswell, Kirby Hill, East Layton, West Layton, Marrick, Marske, Melsonby, Middleton Tyas, Moulton, New Forest, Newsham, Ravensworth, Reeth, Richmond (3), St Martin, Scorton, Scotton, Skeeby, Stainton, Stanwick St John, Tunstall, Uckerby, Walburn, Whashton. The population falling within the union at the 1831 census had been 17,927 with parishes ranging in size from Walburn (population 26) to Richmond itself (3,900). The average annual poor-rate expenditure for the period 1834-36 had been £6,614 or 7s.5d. per head of the population. The shared ownership of the workhouse and gaol buildings on the Long Hill site caused some wrangling but in 1839 it was bought by the new union for the sum of £1,350. In 1842, after part of the original Richmond Poor Law Union had separated to form the Reeth Union, the workhouse was enlarged to accommodate 130 inmates with the addition of vagrant wards and a fever hospital at a total cost of £1,000. Later additions included the installation of four water closets in 1847, and a new board room and vagrants' cell block in 1889. The workhouse layout is shown on the 1891 map below. 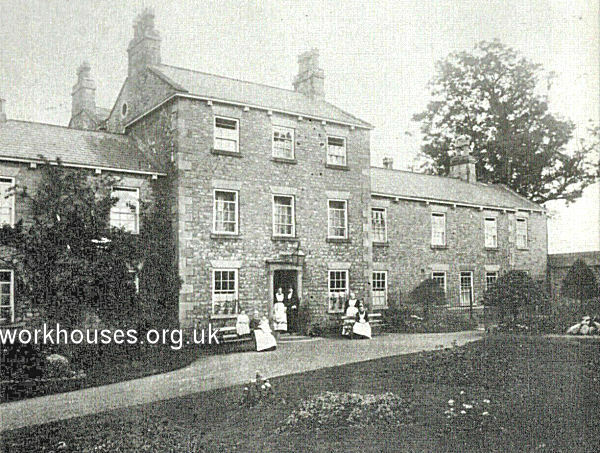 After 1930, running of the workhouse was taken over by the North Riding County Council and Richmond House was used as a Public Assistance Institution, still catering for the elderly, the chronic sick, single mothers etc. In 1961, it became a hostel for old people, then in 1968, the old building was largely replaced to provide accommodation for a new old people's home. The site is now occupied by modern housing. North Yorkshire County Record Office, Malpas Road, Northallerton DL7 8TB. Holdings: Guardians' minutes (1837-1878, 1882-1930); Workhouse plans (1841). Richmond and Reeth Workhouse by Dr P Hastings (Ripon Museum Trust leaflet, 1996).